There are many ways for an individual, group or business to support the Alzheimer Society London & Middlesex. Donations, fundraising and event hosting all make an ongoing difference in the lives of those living with dementia. ASLM only receives approximately 30% of our funding from the Ministry of Health and Long Term Care – leaving the remaining 70% to be raised through community donations, fundraising and support. Your generosity is the reason we are able to do what we do. Without the support of our sponsors, donors, volunteers and community partners, we would not be able to continue to provide support and services for local families living with dementia. Every gift is able to make a difference in the lives of local families living with dementia. We have many different ways to show your support to fit the level of engagement you wish to have within the society. A $100 gift will provide five new books designed specifically for people with dementia. These books would be added to our Resource Library, allowing clients to reap the cognitive benefits and enjoyment of reading, even as the disease progresses. A $250 gift will allow four clients to attend Artful Minds or other social recreation programs, providing socialization and a creative outlet for clients and respite time for caregivers. A $500 gift will cover the cost for six caregivers to participate in a First Link education series, gaining valuable information and strategies to support their loved one. Donate A Car Canada is a hassle-free way to donate your old car and support the Alzheimer Society London and Middlesex. By donating your old car to Donate A Car Canada, ASLM will receive a portion of the proceeds and your donation will provide support to ASLM and the community. Monthly giving is an easy and convenient way to support the work we do, every month! Your dependable monthly gift allows us to plan ahead, so that any gift, large or small, makes an ongoing difference in the lives of those living with dementia. We will mail you a tax receipt at the end of the year for your cumulative donations. Monthly giving allows for a bigger impact than single time giving as it is able to help us plan for the future, save money and ensure sustainability within ASLM. Donating publicly traded securities is a tax-smart way to support the Alzheimer Society London and Middlesex programs and services. Listed securities are considered immediate gifts and include stocks, bonds, bills, mutual funds, warrants and futures that are traded on approved stock exchanges. A tax receipt will be provided for the value of your donation and you will not be subjected to any capital gains tax. Click here to download our Gifts of Securities fact sheet. Click here to download our Securities Transfer form for Financial Advisors. By including a charitable gift in your will to ASLM – you can be our Super Hero and help us fight dementia! Over 50% of Canadians do not have a Will. By taking action and creating or updating your Will and Powers of Attorney, you will protect your family, your assets, save taxes and help in the fight against dementia. Your planned gift could be a bequest, gift of securities, gift of life insurance, major gift or other assets. Click here to download our fact sheet on Planned Gifts and Benefits. Click here to download information on Charitable Bequest language. You can help those affected by Alzheimer’s disease in London and Middlesex by hosting your own event. 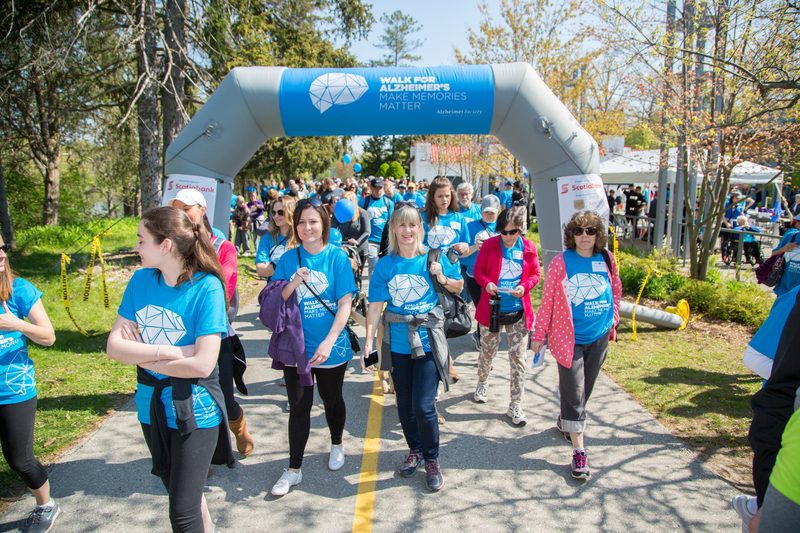 Every year, many groups and individuals host fundraising events in support of the Alzheimer Society London and Middlesex. Every event raises critical dollars and awareness! Click here to download a copy of our Community Fundraising Agreement. Every fall, Alzheimer Societies across Canada participate in the annual Coffee Break fundraising campaign. A “Coffee Break” is a workplace, home or community fundraiser that can include coffee & bake sales, but also so much more – BBQs, yard sales, dress-down days, and much more. All the money raised from your Coffee Break stays here in London and Middlesex to make a difference in the lives of local families living with dementia. For more information visit our Coffee Break page. If you are interested in hosting a Coffee Break or your own fundraising event, fill out the form or contact Rebecca Lafleur-Hannam at rlafeur@alzheimerlondon.ca or call 519-680-2404 ext. 242. Celebrate the moments that bring us closer together by using a celebratory event to help support people living with dementia and their families. Many of our supporters choose to give to ASLM in lieu of favours, gifts or flowers at special occasions. If you can’t think of the right gift for that special someone, why not pay tribute to them with a gift to ASLM? Would you prefer your family and friends to make a donation to a cause close to your heart rather than giving you a gift? Or would you like to make a donation on behalf of your wedding guests in lieu of favours? Our team can offer you a unique way to help celebrate your special day or event. Whether it be a wedding, birthday, anniversary or retirement, your day will be memorable, meaningful and make a difference to the community. Memorial donations to the Alzheimer Society London and Middlesex are a significant way to pay tribute to a relative, friend or colleague who has passed away. You are honouring a special life by helping us improve the lives of those facing the challenges of Alzheimer’s disease and other dementias. Gifts can also be made over the phone, by mail or by dropping by our office. An acknowledgement card of your donation can be sent to the family upon request. Contact us for more information about giving a memorial gift or donate now.